It's hard to believe that it's already April.... About a year ago my 6 teammates and I were coming together for the first time.. but not as an officer team yet.. 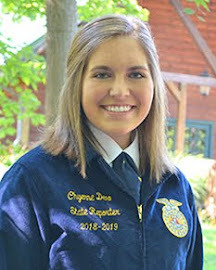 There were 21 outstanding students that decided to run for the position of the 2011-2012 Indiana FFA State Officer.. As a "State Officer Candidate" all 21 of us were asked to be at the Indiana FFA Leadership Center for an entire weekend to help out with State Convention preparations, Spring CDEs and of course attend the State Officer Candidate Open House, to learn more about the positions we were seeking for. It just so happened to be a beautiful weekend in April. 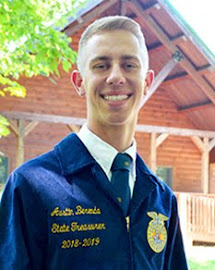 This weekend in April, it's not so beautiful.. A little on the rainy side.. but again 21 candidates are coming together to find out more about a position they are seeking out.. a spot on the 2012-2013 Indiana FFA State Officer Team.. It's crazy to think that a year later these new outstanding students are here to do the same thing that Rachel, Jake, Gianna, Ross, Sarah, Travis and I were doing last year at this time.. I can't help but be filled with excitement, anxiousness, and pride for these new 21 candidates that in just about 50 day will be taking the spots of my team.. Even though it's bittersweet... I am so proud of the individuals that have decided to dedicate the next year of their life to service..
"Service to others is the rent you pay for your room here on Earth. "- Gandhi. Last year's "State Officer Candidates"
Long time no see!!! Actually scratch that yo, Long time no talk! How have you been? How’s the family? 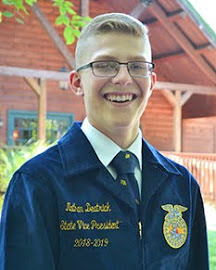 How’s your local FFA Chapter? How’s Indiana FFA? Wait I know the answer to that! Indiana has been extremely Productive, on the move, extremely fun, Inspiring, Impacting community’s, competitive, and preparing! This time of the year is a special time for Indiana FFA and likewise Indiana FFA officers! I know I can speak for the whole time when I say we have been productive! We have been on the road and in the office getting everything ready for the 83rd Indiana FFA convention. We are working to make this convention the best yet. Maybe its Anchorman references, techno and dance music, Great keynote speakers that will leave you in tears (laughing so hard), an opportunity to give clean water to those in need, giving blood to save a life, and so much more! This year’s state convention will be one that you will never forget. 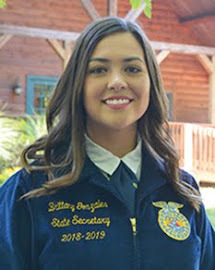 If you haven’t made your plans to attend state convention, talk to your advisor today. Inspiring and impacting. Two words that we use constantly in Indiana FFA! But we really do own up to those very words. Whether it be Princeton and Gibson southern FFA chapters supporting their community’s by purchasing a grain rescue tube and saving a local life. Or Shenandoah’s Snug harbor prom where they invite those with handicaps and disabilities to attend prom at their high school or Scottsburg and Hoosier Hills FFA chapter helping fellow Hoosiers affected by tornadoes. 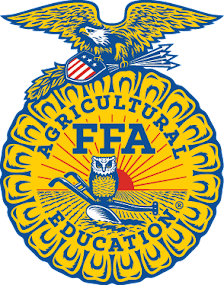 Likewise this week in Indiana FFA numerous amounts of competitions will be happening. Sections will be finding out who is best in Parliamentary procedures. 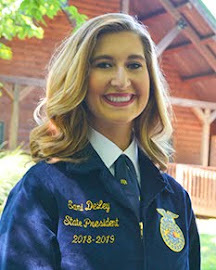 The state officers will also be see Star farmers SAE’s. Indiana FFA is truly on the move and is hard at work to improve the lives in the youth of Agriculture. FFA Members, Why Are We Here? As I sit in the office at the State Officer House, I will occasionally glance at the countdown clock that hangs on the wall to the side of my desk. With every glance, I see a number lower than the one before. With every glance, I realize that this crazy adventure is winding down. On April 5th, Sarah and I tagged along with Rachel to the Crothersville Banquet. When we walked in to the cafeteria, we were greeted with tables that were extravagantly arranged with placemats, programs, and freebies for guests to take home. Their camouflage theme was incorporated all over the room. 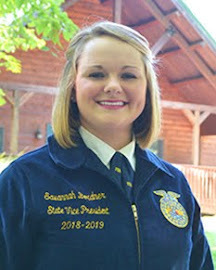 As the banquet continued, door prizes were handed out, Rachel gave a wonderful speech about serving others, and awards were given to the Crothersville FFA members. 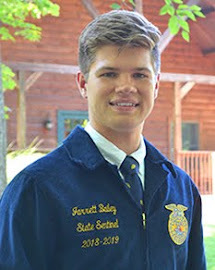 It was neat to see FFA members awarded for their work and passion. I will never forget when they announced the person who won the Most Improved Middle School Member award. Based on his reaction, one could tell that he deserved every bit of it. It was also obvious that this award had inspired him to put in even more effort into making his FFA career the best it can be. It's amazing how recognizing an individual can be so motivating for them. It's moments like these, when we're all standing during Opening Ceremonies and watching others being recognized for their accomplishments, that make me reflect on the crazy FFA journey that has taken place in my life for the past 6 years. Whenever I glance at the countdown clock, I know it's coming to an end, but I also know that there are still many memories to be made.